Beginner Mode is wattage only. The wattage range is 7-100 watts. Intermediate Mode has wattage and temperature control. The temperature range is 200 - 600℉(100 - 315℃). Press the Power button three times quickly while in Intermediate Mode to switch between Variable Wattage, Nickel, Titanium and Stainless Steel modes. Expert Mode has three custom settings where you can set power and temperature levels. * Easy to read TFT screen. * Affordable price in several colors. The Kangertech Vola Starter Kit is a 2000mah Wattage and Temperature Control mod partnered with an airflow controlled 2-4 milliliter sub-ohm tank. The Vola is available in six colors. The kit comes in a sturdy, cardboard, flip-open box. The left side is marked "USB". It contains an Authenticity card, a micro USB charging cable and a Users Guide. The right side box marked "Vola" contains two coils. An R2-OCC Nicr 0.4ohm single core(20w-100w) pre-installed and an R8-OCC Nicr 0.2ohm four core(30w-140w), the Vola Sub-ohm tank and the Vola 100w mod. 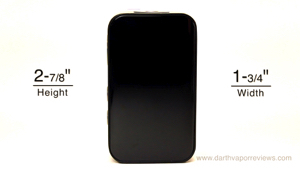 The Vola is a 2000mah Wattage and Temperature Control mod. It is roughly 2 - 7/8" in height by an inch and 3/4 in width. It has a 510 connection. A large, textured Power button, Plus and Minus buttons and a USB charging port. Five clicks of the Power button turns it on or off. 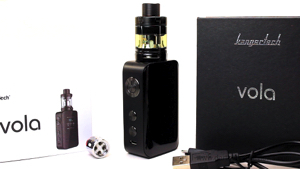 The TFT screen features the battery level, power, resistance, puff counter and vaping time. 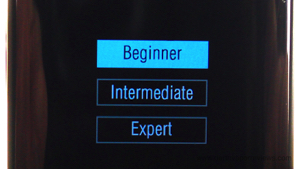 Press the Power and Down button together to enter the modes: Beginner, Intermediate and Expert. 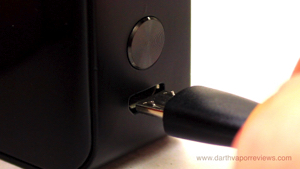 Press the Power and Up buttons together to lock or unlock the screen. You can still vape when locked, you just can't change the settings. Press the Up and Down buttons together to change the screen brightness. 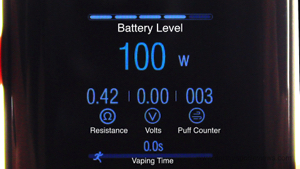 At the bottom of the TFT screen, a runner icon displays the vaping time. The Vola Tank is a top-fill, airflow controlled. 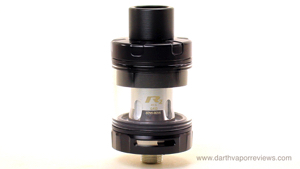 510 threaded, sub-ohm tank with a 2 to 4 milliliter e-liquid capacity. 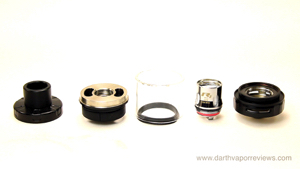 It features a removable Delrin drip tip and can be dismantled into six main parts for cleaning. To change the coil, unscrew the old one from the base and screw in the new coil. 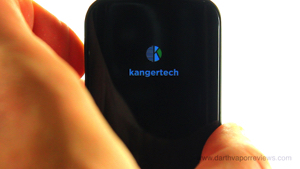 If you would like to pick up the Kangertech Vola starter kit for yourself, just click on the links or the logo below. Have an excellent day and may the Vape be with you. I also wish the Vola tank came with an RBA. Other than that, I like the size, weight, rounded corners and the metal textured buttons have a high end feel to them compared to clicky, plastic buttons. 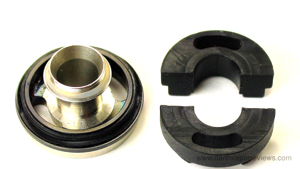 If you have a 2ml version, you can remove the rubber stoppers under the cap to make it 4ml capacity. The TFT screen is also clear and easy to read. The runner icon looks cool, but you'll never see it while you're vaping because it resets when you release the Power button. I think a Digital Clock would be a much better feature. Overall, except for the short battery life, I like this little mod and sub-ohm tank combo. To fill with e-liquid, unscrew the top cap from the tank. Fill with e-liquid through the ports in the top. Once full, replace the cap and let sit for a few minutes to let the e-liquid soak into the organic cotton. Attach the Vola tank to the Vola mod and you're ready to vape. As a fan of Kangertech, I really like this mod, however it does comes with a few cons. The biggest con for me is the short battery life. I'm a lower wattage vaper so at 25 watts, I need to charge the Vola battery at least twice a day. The glossy exterior looks very classy, but it's a huge fingerprint magnet. * Don't see vaping time. Price may change with coupons. 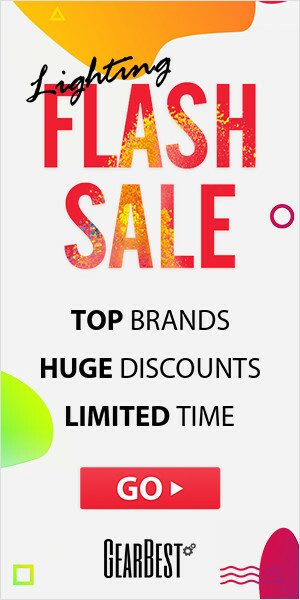 Check for current deals.